Airfix Starter Sets are ideal for beginners. Each Small Starter Set includes glue, brush and four acrylic paints – all that is needed to complete a fabulous first kit! Finished Length 145mm. Probably the most famous warship ever, HMS Victory is still to be seen in Portsmouth Dockyard. This great miniature model is a fun way to start modelling. 1:350 Scale. Skill: 3. Number of parts 202. Britain's six Type 45 'Daring Class' destroyers are the most advanced escorts the nation has ever built. They are designed to shield a naval task force from air attack by using the Sea Viper missile system. Their Aster missiles can knock targets out of the sky over 70 miles away if required. 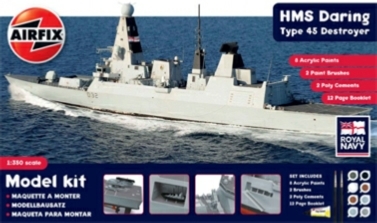 The Type 45 destroyers are also capable of a range of other roles and will spend their commissions switching between them, often at short notice.